Carbon dioxide capture and permanent storage (CCS) is one of the most frequently discussed technologies with the potential to mitigate climate change. The natural target for CCS has been the carbon dioxide (CO2) emissions from fossil energy sources. However, CCS has also been suggested in combination with biomass during recent years. Given that the impact on the earth's radiative balance is the same whether CO2 emissions of a fossil or a biomass origin are captured and stored away from the atmosphere, we argue that an equal reward should be given for the CCS, independent of the origin of the CO2. The guidelines that provide assistance for the national greenhouse gas (GHG) accounting under the Kyoto Protocol have not considered CCS from biomass (biotic CCS) and it appears that it is not possible to receive emission credits for biotic CCS under the first commitment period of the Kyoto Protocol, i.e., 2008–2012. We argue that it would be unwise to exclude this GHG mitigation alternative from the competition with other GHG mitigation options. We also propose a feasible approach as to how emission credits for biotic CCS could be included within a future accounting framework. 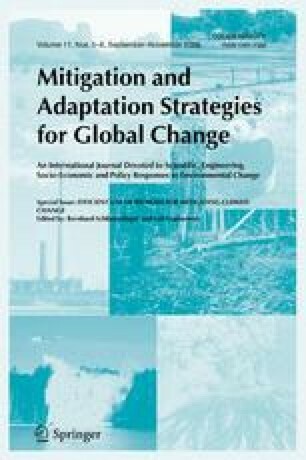 Apps, M., Karjalainen, T., Marland, G. and Schlamadinger, B.: 1997, Accounting System Considerations: CO 2 Emissions from Forests, Forest Products, and Land-Use Change, A Statement from Edmonton. Alberta, Canada, 28–30 July 1997. See also: http://www.joanneum.at/iea-bioenergy-task38/publications/publication1.htm. Brown, S., Lim, B. and Schlamadinger, B.: 1998, IPCC/OECD/IEA Programme on National Greenhouse Gas Inventories–Evaluating Approaches for Estimating Net Emissions of Carbon Dioxide from Forest Harvesting and Wood Products, Meeting Report, Dakar, Senegal, 5 – 7 May. See also: http://www.ipcc-nggip.iges.or.jp/public/mtdocs/dakar.htm. DOE (U.S. Department of Energy): 1999, Carbon Sequestration, Research and Development. A 1999 Report by DOE's Office of Fossil Energy and Office of Science, Washington, USA. See also: http://www.fossil.energy.gov/programs/sequestration/publications/1999_rdreport/. IEA (International Energy Agency): 2003, Key World Energy Statistics 2003, Paris, France. See also: http://library.iea.org/dbtw-wpd/Textbase/nppdf/free/2003/key2003.pdf. IPCC (Intergovernmental Panel on Climate Change): 1997, Revised 1996 IPCC Guidelines for National Greenhouse Gas Inventories, UK Meteorological Office, Bracknell, United Kingdom. See also: http://www.ipcc-nggip.iges.or.jp/public/gl/invs1.htm. IPCC (Intergovernmental Panel on Climate Change): 2000, Good Practice Guidance and Uncertainty Management in National Greenhouse Gas Inventories, IPCC National Greenhouse Gas Inventories Programme, Institute for Global Environmental Strategies, Japan. See also: http://www.ipcc-nggip.iges.or.jp/public/gp/english/. IPCC (Intergovernmental Panel on Climate Change): 2001, Climate Change 2001: The Scientific Basis, Cambridge University Press, UK. See also: http://www.ipcc.ch. IPCC (Intergovernmental Panel on Climate Change): 2002, Proceedings of the Workshop for Carbon Capture and Storage, Regina, Canada, 18–21 November. See also: http://www.rivm.nl/mnp/ieweb/ipcc/pages_media/ccs2002.html. IPCC (Intergovernmental Panel on Climate Change): 2003, Good Practice Guidance for Land Use, Land-Use Change and Forestry, IPCC National Greenhouse Gas Inventories Programme, Institute for Global Environmental Strategies, Japan. See also: http://www.ipcc-nggip.iges.or.jp/public/gpglulucf/gpglulucf_contents.htm. Pingoud, K., Schlamadinger, B., Grönkvist, S., Brown, S., Cowie, A. and Marland, G.: 2004, Approaches for Inclusion of Harvested Wood Products in Future GHG Inventories under the UNFCCC, and Their Consistency with the Overall UNFCCC Inventory Reporting Framework, IEA Bioenergy, Task 38: Greenhouse Gas Balances of Biomass and Bioenergy Systems. See also: http://www.joanneum.ac.at/iea-bioenergy-task38/. UNFCCC (United Nations Framework Convention on Climate Change): 2003, Estimation, Reporting and Accounting of Harvested Wood Products, Technical Paper, FCCC/TP/2003/7, October 27. See also: http://unfccc.int/resource/docs/tp/tp0307.pdf.